Massachusetts non-profit Stop Handgun Violence, March For Our Lives: Boston, and national youth-led gun reform movement 50 Miles More announced the launch of a 50 mile march across Massachusetts. 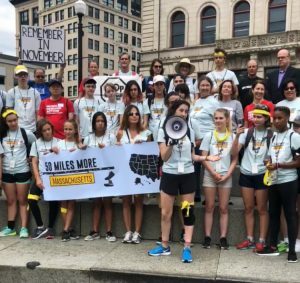 The 50 Miles More: Massachusetts marched, led by local youth activists, in Worcester on August 23rd and ended August 26th with a rally at Smith & Wesson in Springfield. The march and rally aimed to keep gun reform issues in the national spotlight and to draw attention to the fact that young people feel unsafe in their neighborhoods, classrooms, movie theaters, restaurants and homes. Cease the manufacturing and distribution of all weapons outlawed under the 2004 Massachusetts Assault Weapons Ban, including weapons under Attorney General Maura Healey’s copycat weapon ban enforcement. Donate $5,000,000 to research violence caused by Smith & Wesson weapons and monitor illegal use of Smith & Wesson weapons to offset the lack of federal research funding for the gun violence epidemic. Smith & Wesson did not respond to the student demands. Read more why students marched here.